Sir Charles Cavendish and his family took over Bolsover Castle in 1608. Five years later he began an extensive programme of rebuilding the castle, to which his sons added extensions of their own. 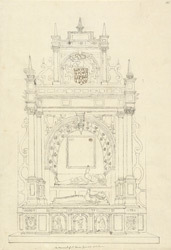 The following is an extract from White's Directory , "Attached to the south aisle is a mortuary chapel belonging to the Cavendish family, and contans two monuments to the members of that family, one of which, in the Gothic style, is to the memory of Sir Charles Cavendish, who died in 1617, and has his effigy in armour, recumbent on a mat, under an enriched arch, supported by Corinthian columns. Underneath is a recumbent figure of his lady, the heiress of Cuthbert Lord Ogle, and beneath her are the effigies of their children in kneeling postures".